Back when the Dreamcast was online, many games had websites you could access on the disk which would have special downloads to add to your games. These include some lovely seasonal themes and extra race tracks for the Sonic Adventure games, new mini-levels for Rayman 2 and replacement characters for ChuChu Rocket. Then of course there were the Mini games. These were unlockable in certain titles, and as long as you have some watch batteries in the VMU, you could play little games on it on the move. In the end not many commercial games actually used this feature (mainly Sega and Capcom titles), but like all things Dreamcast, the Homebrew scene got into the act and programmed countless games, animations and even music for the device. While only one game can be placed on a VMU at any time, there are in total there are around 100 games for download out there. Now most people won't want to go to the hassle to set up their DC online, however, how can you get all this stuff? , although I soon discovered that while you can emulate the Mini games, you can't actually copy them to the VMU to take away, which is a real shame. The other snag is probably he music, which as far as I can tell is not turn-off-and-onable, and also rather dull so you may want to turn the TV to mute while using it. It is, however, very good for save files. VMUTOOL: Available at Blue Swirl, this disc has a hell of a lot of features, including some that need some sort of Dreamcast to PC plug in system going on, but plenty that can be used with just the DC too. This disc's layout may not be as simple or descriptive as BackupCD, it lets you do a whole lot more. 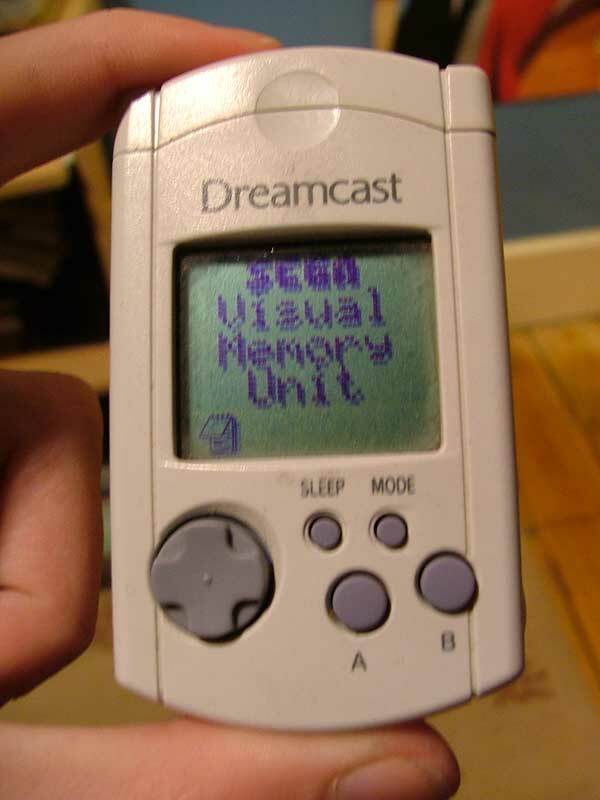 Want to copy a save file to another VMU that the DC Bios tells you "cannot be copied"? Sorted. Want to change the colour and image of your VMU on the Bios without clearing all the files off? Sorted. Want to emulate AND download the mini games? Sorted. You can even slap a new image on the background of the DC Bios. Also the VMU game emulator on this disc is better and the settings are a whole lot more customable. Only thing that I got with this CD was it's a bit fussy which VMU's it lets you edit, and out of my collection of 10 (including the 4 slots on a 4-in-1 card) 2 of the VMU's crashed the CD every time I went into them on it. CONCLUSION: get BackupCD for the save files and compression tools, and get VMUTOOL for the editing and downloadable mini games. There both worth tinkering with. One last note: the Mini-Games run better when actually downloaded to a VMU then they do in Emulation, where they lack their sound and often play to fast. Now, onto the best of the Mini-Games! So while you should hardly expect Game Boy quality hand held games from your VMU, there is some nice stuff to pass the time away from it, so it's well worth a look into. EDIT: Oops, I forgot to insert the links to the websitesthat provide these CDs! There up there now. I'll also add reviews of the Power Stone and Tech Romancer mini-games when I can remember what they were like. Wow - an exceptional post Gagaman, top stuff mate! Yep, it stops bleeping when it has batteries, plus when it's in the Controller the Dreamcast powers it so that doesn'r drain the batteries either. very simple game but one of the first and I commented every single line of the assembly source code for others to learn from. I also did a quick simon says game. Indeed, I have played (and reviewed one in the blog) those mini-games. Nice one. just discovered the delights of the VMU as gagaman said, as someone who came to the DC late i have not seen all it's hidden gems... i have just played Chao adventure on my VMU. DC rules!!!! P.S. what is it about the DC that keeps us hsnging on...?? Yeah, The Gagaman certainly knows his way around the good old VMU! I'm not entirely sure what keeps us all coming back to the DC...it's got a certain magic to it I suppose, and is full of "what ifs"
The Dreamcast's full potential was never unlocked - maybe that's it? Great blog, superb content, loads of energy for the DREAMCAST! Speaking of that I could really do with some help re VMU saves... Like HAYLP!! If you have the time? Of course, Katsujinken - how can we be of assistance? !